The Granbury Chapter was named in commemoration of ELIZABETH PATTON CROCKETT, widow of David Crockett, the celebrated frontiersman from Tennessee who died in the Battle of the Alamo for Texas Independence, March 6, 1836. Elizabeth Crockett and her two children left Tennessee in 1853 to claim Texas land provided for heirs of David Crockett on December 23, 1837, by a Republic of Texas bounty warrant. Arriving in Texas, Elizabeth Crockett and her children made their new home on 640 acres of land at Rucker's Creek, about six miles from present Granbury. Elizabeth resided in Texas until her death on January 31, 1860. She is buried in a 12 by 21-foot burial plot at Acton State Historic Site in Acton Cemetery. Elizabeth's burial spot is marked by a 28-foot marble monument showing a pioneer woman, shading her eyes from the sun, looking to the west, in search of her missing husband. 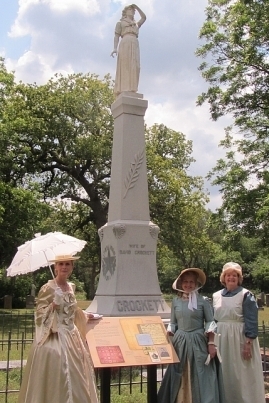 The Elizabeth Crockett Chapter was organized June 5, 1987, at Granbury, Hood County, Texas, with 26 charter members. For technical problems, contact the webmaster. other sites are not the responsibility of the NSDAR, the state organizations, or individual DAR chapters.